Enjoy the BEST BEACH VIEW IN DESIGNER, REMODELED UNIT!!! The kitchen is remodeled with solid wood cabinets and granite countertops. Enjoy your family and friends while entertaining around a 5x9 island, never missing a view of the beach. The island is equipped with a stainless steel sink farm sink w/disposal and dishwasher while the kitchen has stainless steel refrigerator, stove and microwave. Enjoy fully stocked kitchen including all small appliances and cookware you will need. The living room is decorated with unique art, modern lighting fixtures, designer furniture, a large screen plasma TV and plenty of seating for family gatherings. Relax on the large, oceanfront patio with dining and chase lounge chairs. The Master bedroom features a king size bed and fully renovated master bath with over-sized walk-in shower, very large vanity with two sinks and large walk-in closet. You will enjoy the view of the ocean from your master bedroom that opens to your large patio. The first guest bedroom provides a 2 twin beds, plenty of dresser drawer space and a large walk-in closet. The second guest bedroom provides one queen bed with dresser and closet. The beautiful guest bathroom is fully renovated and is centrally located, providing a tub/shower and beautiful vanity with storage. This unit comes complete with an in-suite laundry room with washer and dryer, iron, ironing board and several extra pillows and blankets. Crimson 302 is a NON-SMOKING unit. Great pride has gone into each detail of this unit. We hope you enjoy this beach front oasis for years to come. As a SunHost Resorts managed unit, you will have access to onsite hot tub, heated pool, bbq grills and this property will be fully furnished with all kitchen utensils, linen for all beds, extra pillows & sufficient towels for your stay. When staying in a SunHost unit you will also have access to 7 day a week office staff, office services (fax, copy, print boarding passes etc.) We also have maintenance available 7 days a week if you experience any issues at the property and an after hours on call person. The finest vacation rental in Madeira Beach. All top of the line finishes throughout. Total top to bottom remodel September 2015. New furnishings and artwork. 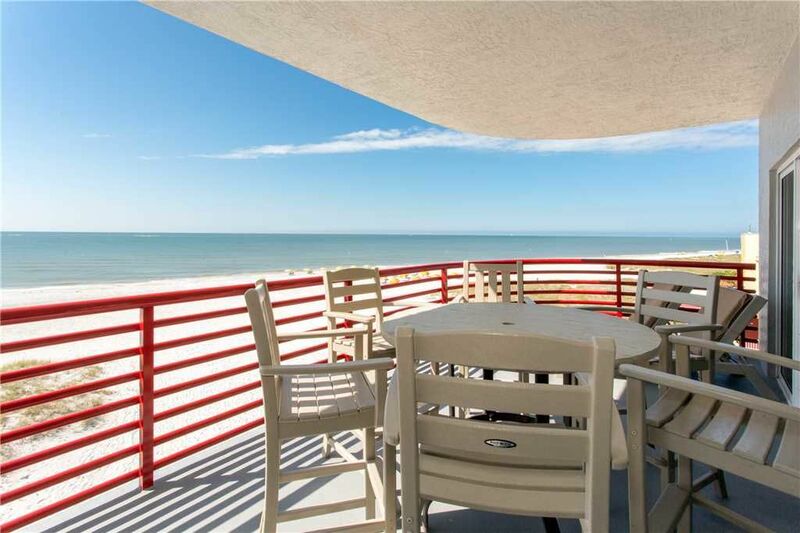 This is the only Beach Front Three bedroom unit in Crimson on The Gulf. We had a wonderful time during our vacation. Lots of family memories have been made. The condo is beautiful with high-end appliances and decorations. It was furnished with all our needs. My only complaint would be that the two queen beds weren’t as comfortable as expected and the queen guest bedroom was rather warm even though we turned the air conditioning down, a ceiling fan might of helped. Overall I would highly recommend this condo, the location and views were extraordinary! The floor seemed a little dirty, but I’m still giving 5 stars. This condo was so nice and we really enjoyed our stay. Would like to come back sometime when the weather will be nice. It was pretty bad this time, but no one can predict that. 302 Crimson is a great condo! We felt like we were at home, not in a rental!! The views were amazing and the location to the beach and Johns Pass were great! We would definitely stay here again when coming to this area! Wow....what a wonderful relaxing stay! The condo has absolutely everything you need except groceries which was an easy drive to get. This condo is really nice and the view of the Gulf is exceptional. The appliances and furnishings are top of the line. The art on the walls were beautiful! The exceptional weather helped make this one of the best vacations EVER! We will stay again.....hopefully be able to get the same condo but won't be afraid to try others offered by Sun Host.